The students claim that the Cherry Hill High School East principal threatened to suspend them or cancel prom and the senior trip if they went through with the planned walkout. Cherry Hill East High School students staged a walk out to protest the suspension of an AP History teacher. Mr. Locke was suspended after making comments about the school's safety in wake of the Florida school shooting. NBC10's Dray Clark reports. UPDATE: Both the Cherry Hill High School East principal and Cherry Hill's Mayor responded to the protest. See their response and their plans here. Hundreds of students at Cherry Hill High School East walked out Tuesday in protest of the suspension of a teacher who spoke out about school safety in the aftermath of the deadly Florida high school massacre. Timothy Locke, a popular AP History teacher at the school, was suspended Thursday after he discussed security concerns in the wake of the deadly shooting at Marjory Stoneman Douglas High School in Parkland, Florida. A petition requesting that Locke be reinstated was signed by 500 students. Some students also staged a protest in support of Locke at the school auditorium Monday and planned the walkout Tuesday. Hundreds of students walked out the front doors of the school around 8 a.m. Tuesday and began marching around the building. Some held up pieces of paper as they walked around campus but carefully avoided going off school grounds. 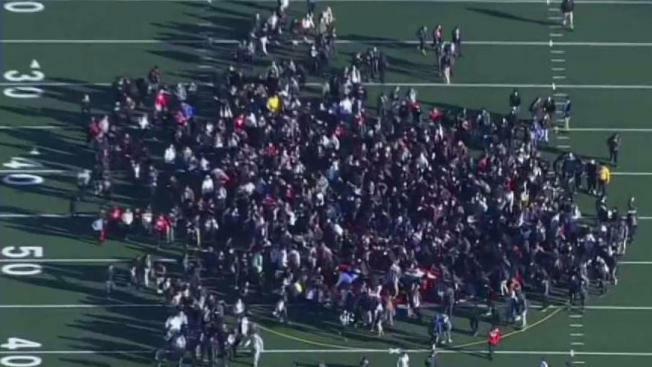 After about 15 minutes of marching, the group of students gathered in a large circle in the middle of the football field. After about five minutes gathered around the 50-yard line, the students began to walk around the track. Around 8:35 a.m., the demonstration marched onto Kresson Road where people drove by. As they marched, the students chanted "free Mr. Locke." The entire protest lasted a little more than an hour before students returned to their classrooms. The demonstration took place despite some students claiming that the Cherry Hill High School East principal threatened to suspend them or cancel prom and the senior trip if they went through with the walkout. “I think we’re allowed to have our own opinion,” said Angela Spiegel, another student. Angry students and their parents voiced their concerns to Cherry Hill Public Schools Superintendent Dr. Joseph Meloche Monday night. Parents say they want better school security and they’ll support their kids taking a stand. Meloche met with parents for around two hours and had urged students who felt the need to protest to do so inside the school gym rather than outdoors. Parents of students also plan to attend a Board of Education Meeting Tuesday night to show their support for Locke. Several colleges and universities, including Temple University, the University of Pennsylvania and Penn State told prospective students that peaceful protests against gun violence will not hurt their chances of being accepted. About 2,100 students attend Cherry Hill East. NBC10 reached out to the principal and superintendent for comment but neither responded as of midday Tuesday.